There’s only 16 days until I’ll be cheering on the US in the 2010 Olympic Games in Vancouver. If you’re like me then you may not know that much about all the events during the Winter Games. Of course I like figure skating – Women’s the best. 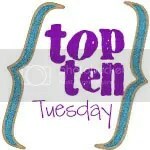 So, allow me to teach you … Top Ten Tuesday Style!! 1. Biathalon – combines cross-country skiing and rifle shooting. Really. I’m sure there’s a story behind that but that just sounds strange!! 2. Bobsleigh – Just watch Cool Runnings for a history lesson in this. I totally loved that movie growing up!! 4. Curling – consists of two teams pushing 19.1 kilogram stones towards a series of concentric rings or circles on ice. Pushing stones? That seems rather Flintstones-ish to me, but it began 500 years ago so I guess it was! 5. Luge – Racing on an open, fiberglass sleds luge racers lay on their back & steer using their legs & shoulders. They brake by sitting up and all events are timed to the thousandth of a second. That means they’re going really, really fast!! 6. Nordic Combined – This sport combines a ski jumping portion followed by a free-technique cross-country race. Using pack-racing strategies, the athletes cluster into “trains” that chase down other athlete trains! That just sounds like a game my 4-year-old would make up!! 7. Short Track – Speed skating with tight corners that make it difficult to maintain control. Otherwise, skate at your own risk because the person next to you might very well take you out! 8. Skeleton – I’m sorry, but I don’t want any part of an event with a name like that!! 9. Ski Jumping – Athletes ski down a long ramp and launch into air at speeds up to 95 kilometers per hour. Or 59 miles per hour … through the air. Flying. Off a ramp!! 10. Figure Skating – Awe it sounds so peaceful & beautiful to watch … doesn’t it?!! I know it’s probably just as dangerous as the others, but it definitely sounds prettier! So there’s the info at a glance. You’re officially ready for the 2010 Olympic Games … Go USA!! Winter Olympics is linked to Top Ten Tuesday at ohAmanda.